Heavy Gear Blitz! Tabletop Wargaming - Living Rulebook Welcome to Terra Nova! 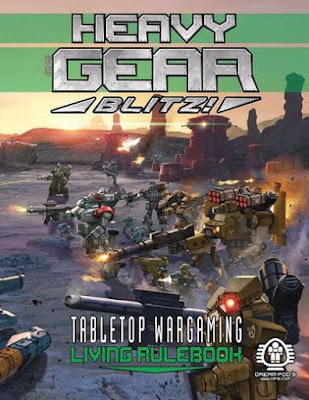 The Living Rulebook is the current new edition for the Heavy Gears Blitz Tabletop Wargame, as of July 2016. The rules and army construction have been refined and streamlined from the previously available Heavy Gear Blitz Living Rulebook Beta released in fall 2015. This Living Rulebook will be a perpetual online resource, and will be updated regularly with new models, forces, and scenarios for you to play. Action point based miniatures Giant Robot game that encourages a Combined Arms approach to attaining victory. Every unit in the game gets a 1 to N action points that allow it to fire a weapon, do forward observation, move at top speed or even do electronic warfare. Movement does not require action points. The game also provides the players with a pool of Command Points that can be transferred from the commander unit automatically if within Auto Comms radius or by using a communications event. Communications events can be stopped by using Electronic Warfare's Electronic Counter Measures with a unit that has ECM equipment. Electronic Warfare, Attacks and Defence are based on opposed skill roll. The skill ratings translate to the number of dice rolled with the highest number being the result (two sixes translate to seven, three sixes to 8, etc.). The game is well supported by DP9 and its fans. There are design tools available in the the DP9 website. The miniatures available for the game are of the highest quality and they have actually been nominated for awards. The game provides and abstracted system for aircraft and artillery support. It could have been called Heavy Gear Blitz 2.0, but it is sufficiently different from the original Heavy Gear Blitz to merit the Locked and Loaded subtitle instead of a 2.0. 1) Only one weapon per unit per turn even if it has more than one action. 2) Top speed movement now requires an action point. 3) STUN counters to signify results of a stunned pilot. 5) Army building is now based on the allowed units for a particular Priority Level. 6) Priority Levels also define Support Points that can be used to buy Aircraft, Artillery, Defencive Structures or even more Command Points. The rulebook is very well organised and the support in the forums in the DP9 websites help the neophyte players immensely. The Field Support Guide is a free update for Dream Pod 9’s Heavy Gear Blitz tabletop miniatures wargame. This down loadable pdf is meant to complement the Heavy Gear Blitz Field Manual rulebook which is the current rule set for the game. It pulls together the universal rules updates that were added in the Perfect Storm: NuCoal Field Guide (NuCoal and PAK factions) and Forged in Fire: Southern Field Guide (all the Southern factions), which are the current army lists of those factions. And, also includes the Combat Engineering, Medical, plus a few other combat groups from various issues of the Gear-Up e-zine. Plus Field Manual and Forged in Fire errata, Field Testing of updated Threat Values (TV) for the CEF, Black Talon, Caprice, Eden, Leagueless and Utopian factions for Gear-Up. New and updated data cards round out the guide. 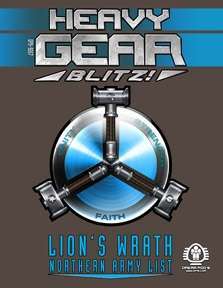 Dream Pod 9's latest ebook only exclusive entitled Lion's Wrath - Northern Army List is now available. This is an abridged version of the delayed Lion's Wrath - Northern Field Guide, for players of Heavy Gear Blitz's Northern faction. Lion's Wrath includes everything you need to make a Northern army, with new vehicles, data cards, updated combat groups and threat values. Choose one of the Confederated Northern City States (CNCS) five army options from the Northern Guard (NG), Northern Lights Confederacy Armed Forces (NAF), United Mercantile Federation Army (UMFA), Western Frontier Protectorate Army (WFPA), Northern Territorial Reserves (NTR), or make a Generic Northern Army. 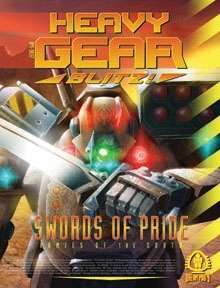 This 54 page ebook is a Faction Army List for the Heavy Gear Blitz! miniature game. In addition to the core rulebook, some six sided dice, and Dream Pod 9 Heavy Gear miniatures are required for play. For two or more players, ages 8 and up. 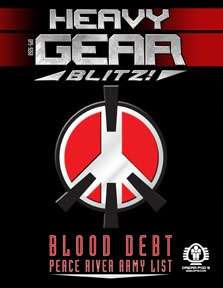 Dream Pod 9's latest ebook only exclusive entitled Blood Debt - Peace River Army List is now available. This is an abridged version of the delayed Blood Debt- Peace River Field Guide, for players of Heavy Gear Blitz's Peace River faction. The Peace River Army List includes everything you need to make a Peace River army, with new vehicles, data cards, updated combat groups and threat values. Choose one of Peace River's five army options, from the Peace River Defence Force, Peace Officer Corps, Home Guard Security Force, Combined Task Force, or the Protectorate Sponsored Badlands Militia. A new Northern Army List ebook only exclusive is also in the works for our Northern faction players in early 2014. 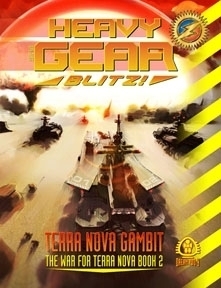 Pick up a Heavy Gear Blitz army and get involved in the War for Terra Nova. 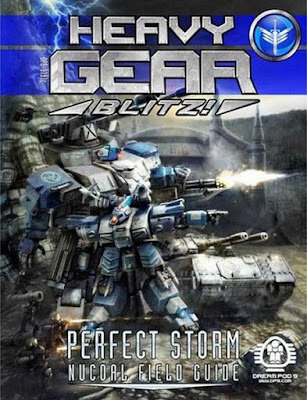 This 32-page ebook is a Faction Army List for the Heavy Gear Blitz! miniature game. In addition to the core rulebook, some six sided dice, and Dream Pod 9 Heavy Gear miniatures are required for play. For two or more players, ages 8 and up. Forged in Fire Southern Field Guide contains the complete army lists for the Southern Republic Army, MILICIA, Humanist Alliance Protectorate Force, Mekong Peacekeepers, Eastern Sun Emirate Retinues, as well as rules for fielding Mekong Mercenary Guild and AST Protectorate forces. Forged in Fire continues the story of the War for Terra Nova and updates the time line for the South to TN1951. - Blitz Army Lists for the SRA, MILICIA, HAPF, ESE Retinues, Mekong Peacekeepers. - Rules for fielding Mercenary Guild and AST Protectorate forces. - Detailed backgrounds on the Southern Leagues and their militaries. 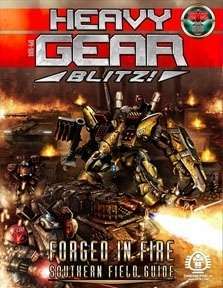 This Full Colour, 176-page book is a Field Guide (Faction Army List) for the Heavy Gear Blitz! miniature game. In addition to the core rulebook, some six sided dice, and Dream Pod 9 Heavy Gear miniatures are required for play. For two or more players, ages 8 and up. 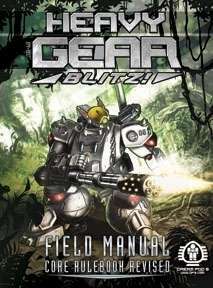 The Heavy Gear Blitz Field Manual - Core Rulebook Revised is the current rules set for Heavy Gear Blitz. 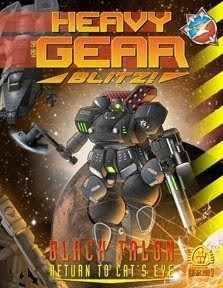 It adds a new and exciting style of game-play to Heavy Gear Blitz! 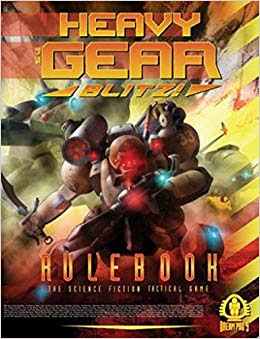 This book takes the field test rules featured in the first 3 issues of our Gear UP eZine and revises the Locked & Loaded rulebook sections with new rules, flow charts for ease of use and new data cards for the Heavy Gear Blitz! miniatures. 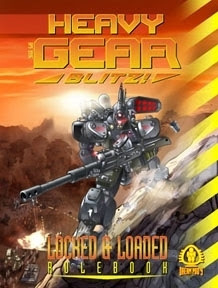 The Core Heavy Gear Blitz miniature game rulebook for all players; Requires the use of the Locked & Loaded Rulebook (Northern, Peace River Defence Force, or Leagueless Army Lists), Black Talon Return to Cat's Eye (Black Talon, C.E.F. or Caprice Army Lists), Terra Nova Gambit (Utopian Army List), Perfect Storm NuCoal Field Guide (NuCoal or P.A.K. Army Lists), Forged in Fire Southern Field Guide (Southern Army Lists), or Dream Pod 9's free Gear Garage Software available on our website to build your armies. Also requires the use of six-sided dice (not included) and Dream Pod 9 miniatures. For two or more players, age 8 and older. The Perfect Storm NuCoal Field Guide contains complete army lists for the NuCoal Self Defence Force and the Port Arthur Korps. It also continues the story of the the War for Terra Nova and is the first in a series of Field Guides for the factions in the Heavy Gear Universe. 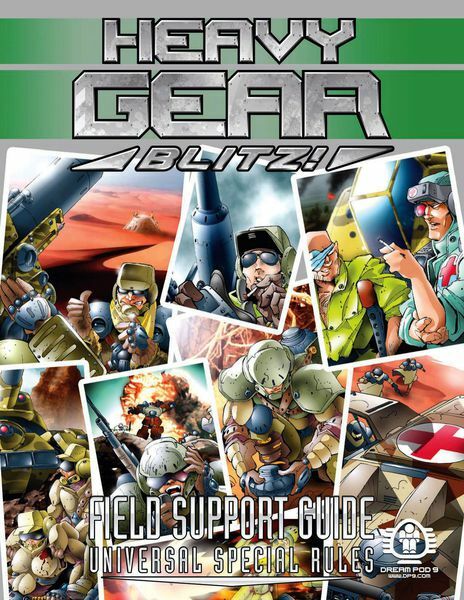 This Full Colour, 136-page book is a Field Guide (Faction Army List) for the Heavy Gear Blitz! miniature game. In addition to the core rulebook, some six sided dice, and Dream Pod 9 Heavy Gear miniatures are required for play. For two or more players, ages 8 and up. "What's left to do?" Sergeant Major James Anders asked his commander in the decrepit old Jaguar. Anders knew it was only a matter of time before the end would come for the land fleet they had been guarding. The fleet officer had told the gear sections to retreat once the order was given. "Not long, son. They'll give us the word," Colonel Arlens replied. At seventy nine cycles, the grizzled War of the Alliance veteran was nearly the oldest member in the provisional regiment. The unit had been thrown together at the last minute to defend the Protectorate from the approaching invaders. None of the pilots on the field were younger than fifty cycles and most were near the colonel's age. Sergeant Major James found himself on the younger end of the spectrum, but no less committed to the cause. The WFN Defiance, an ageing carrier class land ship, groaned in protest at the relentless attacks from the CEF forces in the canyon. The massive carrier inched past the gears engaged in the hopeless fighting. Anders could hear the strain of the land ship's repulse magnetic system echoing throughout the canyon's walls. At that moment, Sergeant James Anders knew what he always understood when he volunteered for the mission. There would not be any escape. Only the Honor of dying next to his fellow soldiers. In the face of overwhelming odds and desperation, Maderas Betomas, commander of the Defiance, issued his final order, setting the canyon ablaze in a nuclear holocaust. Background Information on the CEF's Utopian Colonial Corp Allies. Rules for fielding Utopian Colonial Corp Armies and the new CEF HC-3 Combat Group. Advanced League and Campaign rules. Data cards for each of the vehicles presented in the books. 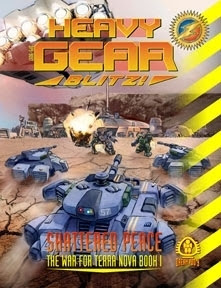 This Full Colour, 54-page book is a campaign supplement for the Heavy Gear Blitz! Locked & Loaded Rulebook. In addition to the core rulebook, a copy of Black Talon: Return to Cat's Eye, some six sided dice, and Dream Pod 9 Heavy Gear miniatures are required for play. For two or more players, ages 8 and up. Three days have passed since Marabou, home of the Southern MILICIA, was obliterated by the CEF. Today, Earth forces descend on Terra Nova, blackening the skies, as thousands upon thousands of drop pods block the rays of Helios from reaching our planet. People of Terra Nova, we stand on the precipice of destruction. They have come, uncaring, inhumane, and relentless. But they will be stopped. For those who have died, for those who will die and those who will be opposed, we must fight back. We will prevail! The next few days will decide the fate of the planet, and although few know it, the fate of the galaxy and of humankind rests on Terra Nova. * Stats and army information on the CEF's allies from Eden. * Stats and information on the CEF's Commando Frame Squads. * Schematics of the CEF's new Assault Lander and HHT-90 Overlord Hover tank. * Big Map of Terra Nova with all the battle fronts shown. * Maps of each of the CEF's seven drop zones and space battle. * Guidelines for linking Scenarios and running them as a mini campaign. * Army, campaign and scenario sheets for home or campaign website use. * Time line Narratives set during the War for Terra Nova. * Data cards for all vehicles presented in the book. 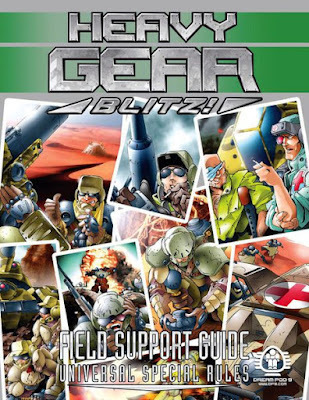 This Full Colour, 54 page book is a campaign supplement for the Heavy Gear Blitz! Locked & Loaded© Rulebook, and requires it as well as Black Talon: Return to Cat's Eye for play. It also requires the use of six-sided dice and Dream Pod 9© Heavy Gear© miniatures. For two or more players, ages 8 and up. Aftershocks and political fallout from the Inter polar War and the destruction of Peace River have left Terra Nova reeling. With Earth identified as the culprit, Terra Nova's governments have resolved to never to be caught off guard again and the Black Talon program was formed for the purpose of being sent off planet to recon Earth's former colony worlds. Their first mission is the gate world Caprice, with its orbital fleet yards that were the staging grounds for the first attack on Terra Nova. They have the training and equipment with which to observe and sabotage Earth's Colonial Expeditionary Force (CEF) wherever opportunities arise and gain new allies whenever possible. * Full backgrounds on all three armies presented in the book. * Options for Terra Novan Armies post TN1940. * Additional terrain and table effect rules for battlefields across the galaxy. * Rules and Guidelines for uneven Threat Value games and story-driven engagements. * A continued time line covering from where Locked & Loaded left off to the beginning of the Battle for Terra Nova. * An overview of the opening stages of the Battle for Terra Nova. * Newly re-organised Data cards for all variants to date, for easier play. 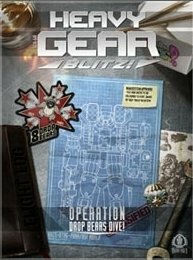 This book is a supplement for Heavy Gear Blitz! Locked & Loaded, and requires it for use. Also requires a few six-sided dice and Dream Pod 9 miniatures. For two or more players, ages 8 and up. Heavy Gear Blitz! 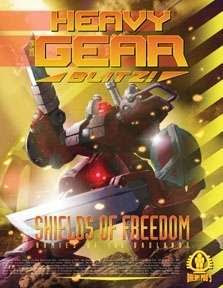 is the latest (2006) Heavy Gear miniatures game from Dream Pod 9. A much more streamlined version of the original tactical game but in a very new design. Still holding true to the Silhouette game system old players should find the game very familiar and new players should find it fast and easy to learn. Its eliminates the hex based maps and uses a to-scale terrain system familiar to most miniature games. The rulebook contains an introduction to the world of Terra Nova, the revised and streamlined rules, basic field guides for the forces on Terra Nova, a random scenario generator, 28 data cards covering all the standard vehicles in the field guides, as well as an assortment of counters for tracking the battle status of your army. – Overviews of the major Badlands Factions of Peace river and Port Arthur. – Backgrounds on all the major war machines. – In-depth field guides for the Peace River Defence Force, Port Arthur Korps, and Leagueless Badlanders. -New squads, including many new, never-seen-before vehicles for the PRDF, the Hover tanks used by the Port Arthur Korps and the patchwork groups used by desperate Badlanders. – 20+ Data cards covering all major Badlands-use designs for easy Reference. - Full Colour E-Book saved with pictures at 144dpi for good quality printouts. Supplement for Heavy Gear Blitz! Requires the main Heavy Gear Blitz! Rulebook (DP9-996) and a few miniatures to play. Terra Nova is a world on the brink of war. The Allied Southern Territories are standing proud, ready to defend the planet against the arrogantly puritanical Confederated Northern City States. Built on culture, united by force and honed by pride, the armies of the South stand as legions ready for their true destiny. Fanatics of the North and ignorant Badlanders shall unite under the proud banner of the AST, for only then may they be free. The question remains, however, is freedom granted by those who conquer or formed by those who fight for independence? Swords of Pride contains everything you need to know about the armies of the South. With an overview of Southern politics and history. Backgrounds on all the major war machines. In-depth Field Guides for the Southern MILICIA, all four Southern League armies as well as unique organisations within the Southern militaries. New squads and options to let a Southern commander handle nearly any situation. 30+ Discards, covering all Southern designs and major variants, for easy reference. Requires the use of the Heavy Gear Blitz! Rulebook (DP9-996). Printed Softcover is 64 pages (Including 8 colour pages), e-book is full colour, except for the data card section. 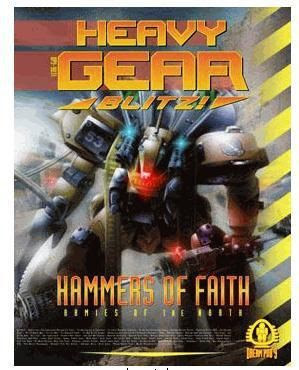 Hammers of Faith - Armies of the North, is the first of the Army Books for Heavy Gear Blitz! The world of Terra Nova is polarised. The Confederated Northern City-States are once again vying for control of the planet against the hedonistic, immoral Allied Southern Territories. Founded on Faith, strengthened with unity and tempered by war, the armies of the North stand as the bastion of righteousness on Terra Nova. The patriotic soldiers of the Northern Guard stand ready to protect their countrymen and the independent Badlanders against Southern imperialism, and even take the war to the South. But can they really defeat the Southern juggernaut? Hammers of Faith contains everything you need to know about the armies of the North. With an overview of Northern politics and history. Backgrounds on all the major war machines. In-depth Field Guides for the Northern Guard and all three Northern league armies. New squads and options to let a Northern commander handle nearly any situation. 30+ Data cards, covering all Northern designs and major variants, for easy reference. Requires the use of the Heavy Gear Blitz! Rulebook (DP9-996), Softcover, 64 pages (Including 8 colour pages).